The Palazzo, one of the new Las Vegas hotels currently reaching skywards, has confirmed its set to open on December 20th 2007. 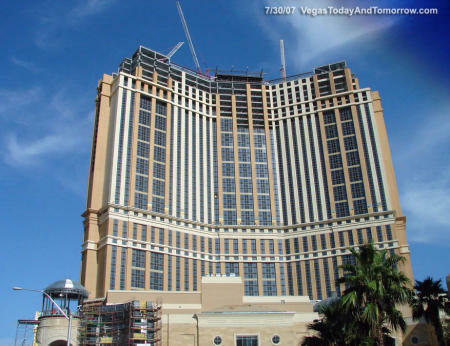 Some people are surprised by this given its current state of construction (see pic above, taken on 7th July 2007 and courtesy of Mark Adams), but the Las Vegas Sands Corp., owners of the Palazzo, are confident they can make this date. When it’s complete, the Palazzo, when combined with its sister hotel the Venetian, will be “the largest integrated destination resort in the world” with 7,128 hotel rooms and 2.3 million square feet of meeting space on the Las Vegas Strip. It should also be a good little earner, given that the Venetian has just posted revenue of $235.5 million for the quarter for the Venetian.